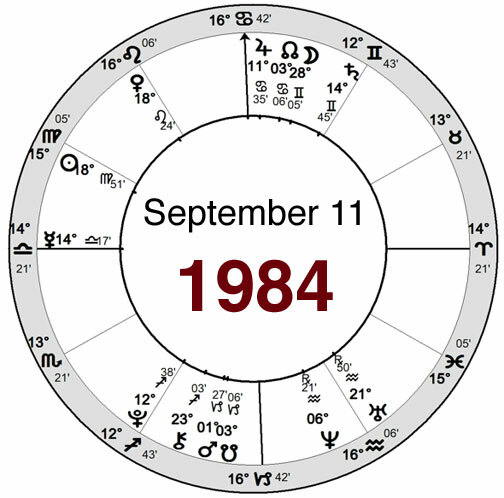 WHEN 9-ELEVEN WENT DOWN, we can be sure that astrologers all over the world ran (not walked) across the house, typed the data into their computers and had a look at the chart. For those who speak the language of astrology, it's a remarkable horoscope, and I'm going to do my best to relay my interpretation of the chart to you, which is more or less what I came up with in the first week after the event. I'm going to use only the most basic elements of traditional astrology. I'll keep it slow and simple. All the glyphs you need are in red, below. Our chart is set for 8:46 am EDT, Sept. 11, 2001 in Manhattan, when Flight 11 hit the North Tower. That was the beginning of this event, from an astrological standpoint; this event is the reason for casting the chart. The first thing we notice about the chart is that Mercury is rising. See him down there exactly on the eastern horizon on the left side of the chart, the little guy with horns? Remarkably, this planet is occupying the very degree rising, which it does for just four minutes each 24 hours. This placement makes Mercury prominent, extremely powerful and the star of the show. Mercury is the messenger of the gods, the planet of communication in a culture that is based on media. This chart is about a message, which is being delivered so clearly and with such force that it will reach every person and change world history. In Libra, we could say there is some message of justice or of balance. In this chart, Mercury has a second meaning. Because the sign Virgo is on the cusp of the 12th house, we can say that Mercury is the ruler of the 12th. The 12th is the house of secret enemies, so Mercury is also the incarnation of the secret enemy, and he's rising. Who or what is that secret enemy? We'll see what the chart suggests in a moment. Whatever he is, though, he's mercurial. He defies shape and form, and slips through your fingers. Mercury is trine Saturn, which is in Gemini. A trine (120-degree relationship between planets or points) is an aspect that suggests an exceptionally harmonious flow of energy between them. Mercury and Saturn are perfectly aligned. There is a powerful cooperative relationship between these planets and whatever they may represent. Saturn, the planet of structure, is the first planet we look to for a representative of the government, the corporate structure, and the law. Standing in Gemini, he makes a nice picture of the twin structures of the World Trade Center. Interesting, too, that Saturn is located in the 9th house of foreign policy affairs, wielding his influence in the larger world -- via the World Trade Center. The American business establishment generally does this by oppressive methods, from the World Bank moving in and taking over the economy, to military jets going for the fast kill. It is this oppressive international power establishment, represented by Saturn, that was attacked by Mercury, our secret enemy. Now, who is this secret eneemy? This is why we use astrology. Astrology gives us a look behind the veil. Here's where we arrive at an interesting twist in the interpretation. Mercury is located in the sign Libra. Saturn is located in the sign Gemini. Mercury is the ruler of Gemini, and Saturn is one of the rulers of Libra (known as the exalted planet). They occupy one another's signs. This is a special condition, based on an ancient astrological rule, called mutual reception. When two planets are receiving one another, they work so closely that they can be interchanged. Either planet can be read in either position. They are also functioning as one system or concept. So, here, the secret enemy, Mercury, and the business establishment/government, Saturn, are not only in a perfect trine, and they are in mutual reception. There is really no way to have these two planets -- which supposedly represent adversaries, the structured government and the slippery terrorists -- working in closer harmony. At least it is possible to say that the attack on the World Trade Center was capitalized on (literally and figuratively) as an excuse for "waging war on terrorism." This meant not an investigation or covert war against the few people who might have orchestrated the attack, but rather bombing the entire country where one guy (Osama) was supposedly hiding, and getting rid of the Taliban allegedly for cooperating with terrorists. Of course we never caught Osama, but we did clear the way for numerous long-planned oil and natural gas pipelines across Afghanistan which will be used by American companies (ExxonMobil and Unocal, for example) to supply Asian markets. If you read the alternative press, you will see references to this war having been planned anywhere from July 2001 to as far back as 1998. So, there is a relationship of convenience between Mercury and Saturn. Mercury gets to make a big political statement. Saturn seizes the opportunity and gets to make a war, enrich military contractors, and open the way to do a lot of business in Asia. Religion also enters the picture. I say this because Saturn appears in the 9th house, and that is the house where we spot what you could call religious issues. Mercury and Saturn doing their mutual reception thing suggests a certain distinct similarity in spiritual dogma between the two, and it's true. Whether you're talking lunatic fundamentalist Islam with its Jihads, or lunatic fundamentalist Christian with its Apocalypses, both views support the "end of the world" theory. 9-Eleven drew very nicely on what I would call a kind of faux-apocalypse motif for its rather profound dramatic effect. I bet there were a whole lot of people who knew The End had come that day. We could take the interpretation a step further and say that the relationship between Saturn and Mercury is so close that they were fully aware of one another's actions in advance. Of course, whoever was responsible for knocking down the World Trade Center knew that there would be a war as a result. But what if the war machine had some warning, and kicked back and had a beer, waiting to see what would unfold? Apparently, as was reported in the media this past Spring, there were warnings picked up by the FBI and the CIA, as well as warnings from foreign governments as well. We just "failed to put the pieces together," but hey, it all worked out great. Conspiracy theory? The beauty of conspiracy theories (for the conspirators) is that most people, upon hearing them, will say either, "That's preposterous!" or they will say, "Conspiracy!" to which normal people will say, "You're a conspiracy theorist," which is another term for gullible, paranoid fool. This is a perfect environment within which to engage in conspiracy because nobody notices; everyone is too smart. But there is one last angle to look at, what you might call the psychological one. The 12th house, the house of secret enemies, is also the house of the collective unconscious. It is the world of creepy-crawly fears, dreams, nightmares, and delusions. Mercury rising, as the ruler of the 12th, is a representative of our unconscious. He is here to tell us that we, that is, we Americans, are in denial of the way we conduct ourselves in the world: typically, as tyrants with an agenda that includes killing anyone who doesn't go along with our friendly Democratic plan.